Explanation: Early in November, small but active Comet Hartley 2 (103/P Hartley) became the fifth comet imaged close-up by a spacecraft from planet Earth. Continuing its own tour of the solar system with a 6 year orbital period, Hartley 2 is now appearing in the nautical constellation Puppis. Still a target for binoculars or small telescopes from dark sky locations, the comet is captured in this composite image from November 27, sharing the rich 2.5 degree wide field of view with some star clusters well known to earthbound skygazers. 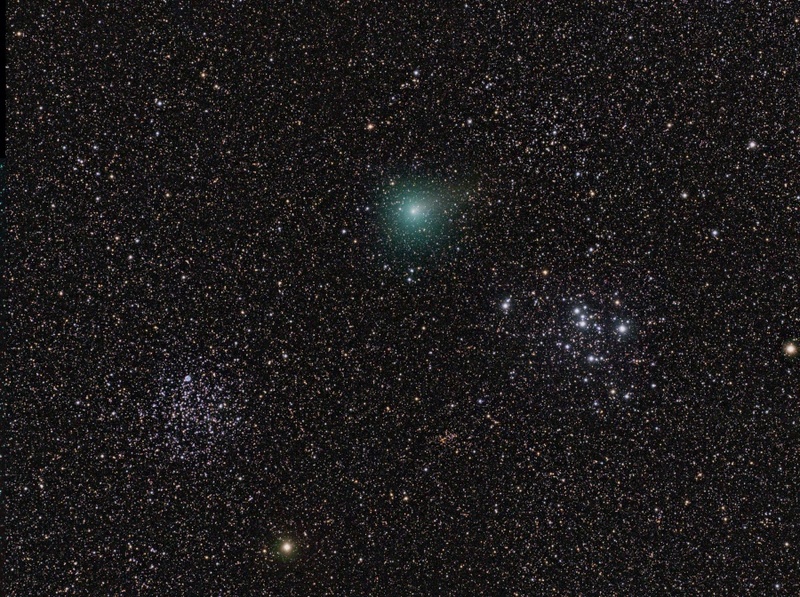 Below and right of the comet's alluring green coma lies bright M47, a young open star cluster some 80 milion years old, about 1,600 light-years away. Below and left open cluster M46 is older, around 300 million years of age, and 5,400 light-years distant. Hartley 2's short, faint tail even extends up and right toward another fainter star cluster in the scene, NGC 2423. 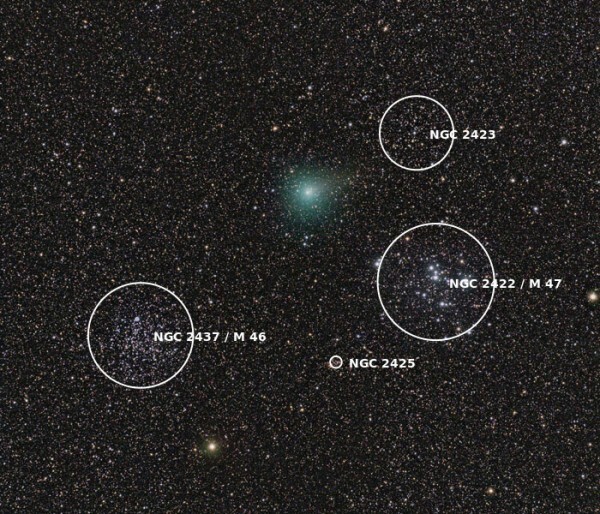 On November 27, Comet Hartley 2 was about 2.25 light-minutes from Earth. 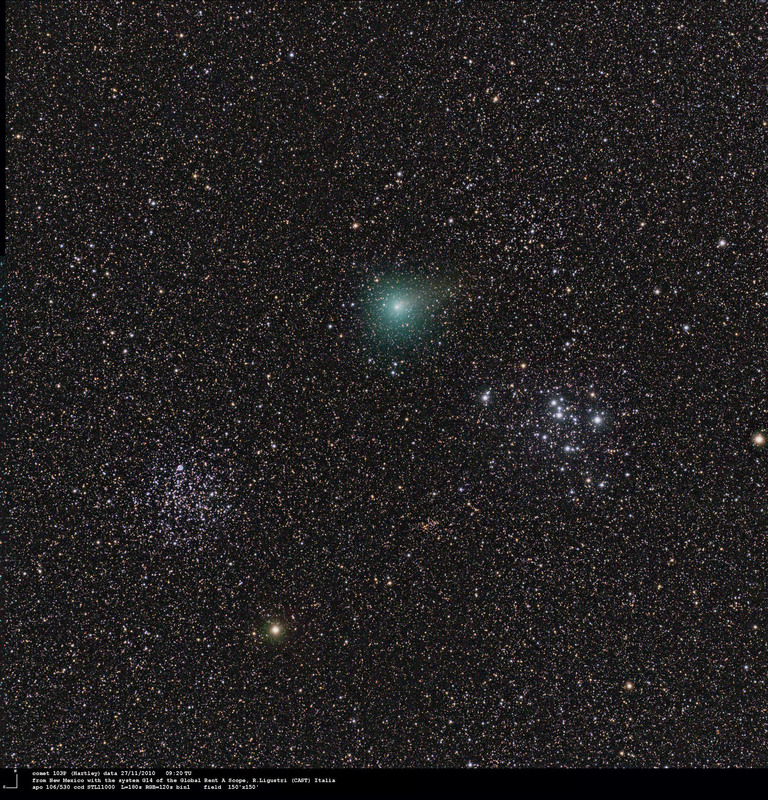 Sweeping toward the bottom of this field, by November 28 the comet's path had carried it between M46 and M47.